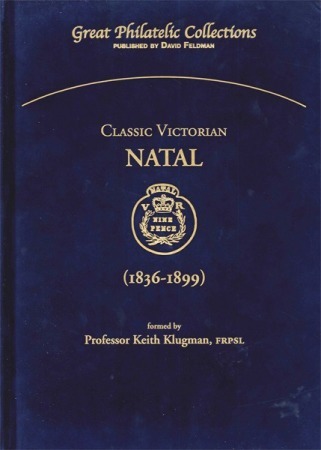 Collection formed by Prof. Keith KlugmanThe stamps of Victorian Natal fall into two periods. The first issue of 1857–59 are among the great primitive classics of the world. These stamps were imperforate bits of colored paper embossed with dies designed for revenue purposes. As both the dies and the original paper were available for some thirty five years after their issue, reprints exist indistinguishable from the original stamps, so the embossed stamps can only be described as truly genuine if they are used, or on cover with postmarks known to have been used on genuine letters. Mint examples are thus excluded from all major Natal collections. These stamps were highly sought after by great early collectors like Ferrari and Tapling. This exhibit is the most comprehensive showing ever of the embossed postage stamps of Natal and their uses, including 2 of 3 tete-beche 3d pairs in private hands. Stamps based on the stunning portrait of the young Queen Victoria by Chalon replaced the embossed stamps in 1859 except for a brief period when there was a shortage of Chalon stamps in 1861. The Chalon head stamps were printed by Perkins Bacon and then by De La Rue. They were initially valid for both postage and revenue purposes but from 1869 were overprinted for postage only. The “Postage” overprints of 1869 represent the biggest collecting challenge after the embossed issues, as they exist in 6 forms. The collection houses the largest collection of these stamps in private hands and in particular the most mint shillings of 1869 in any collection since the Ferrari collection was sold in the 1920s. The most prized items of Natal of the 1870s are combinations on cover with stamps of the Transvaal and 9 of 14 in private hands are in the collection. Even more rare are combinations with the Orange Free State in 1880/1 and 2 of 3 known are in the collection. During the 1880s there was a short lived Boer Republic called the New Republic that issued stamps from 1886-8 and the collection includes virtually all the major covers sent through or to Natal. The highlights of the 1890s are the short lived Ship Letter mark of Durban which is struck on great combination covers of Rhodesia and Moçambique (shown). Also shown are 8 of 12 other Ship Letter covers recorded with origins around the Indian Ocean. The other 1890 highlight of Natal philately is the Madagascar British Inland Mail letters sent via Natal during the Hova rebellion against the French and here again most of the major items are illustrated in the collection. The scope of the collection is from the earliest letter in private hands (from an American missionary in Natal in 1836), to the outbreak of the Second Anglo Boer War in 1899. There has been no major collection of Natal exhibited internationally since the 1940s. There is no handbook of Natal beyond plating studies published by Mann in the London Philatelist in the 1940s. 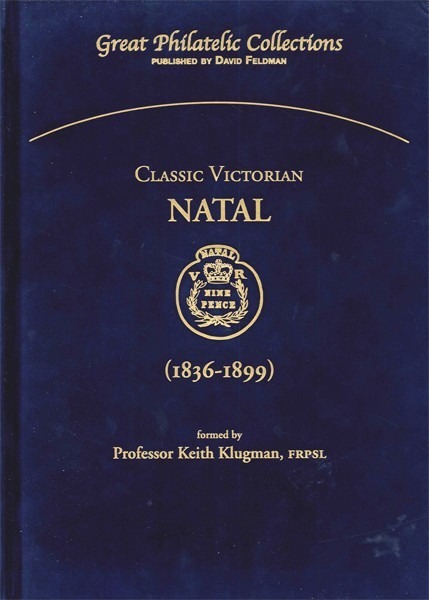 Archival studies are being published in the Cape and Natal Philatelic Journal by John Dickson, but until a major work on the stamps and postal history of Natal is written, this book, which illustrates the finest collection of Victorian Natal ever formed, will serve as the best picture we have on what exists of the 19th century stamps and postal history of Natal.